Ever wondered why long car journeys make you feel tired and sleepy? Is it the boredom of endless, never changing motorways or perhaps something else? Gas Sensing Solutions, wondered if it could be a build-up of CO2 gas because, at levels of 1,000ppm and above, people can become drowsy and lethargic. 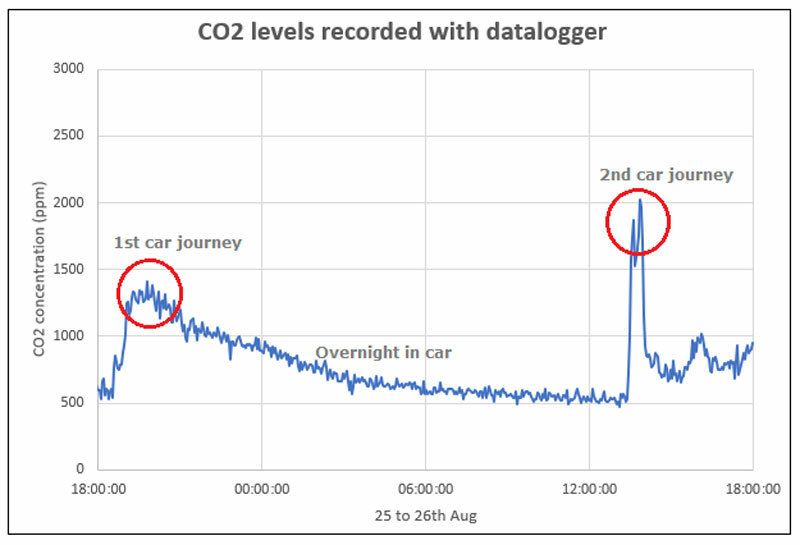 So they took a CO2 datalogger from their gas sensor range on a road trip to find out how CO2 levels changed throughout the journey. 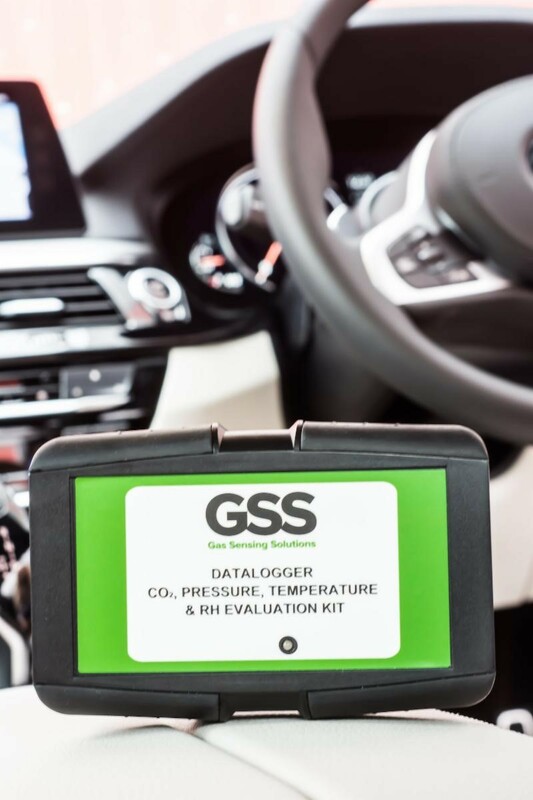 Dr David Moodie, Technical Manager at GSS, explained: "This follows on from our trip to Asia where we used our CO2 datalogger to measure CO2 gas levels on planes, trains and taxis. We were surprised that levels were the worst in taxis - peaking at an astonishing 10,000ppm on one journey - so we decided to check the levels on our own road trip in the UK." Before the datalogger took to the road, it was first used to test CO2 levels in a stationary car. This would show the impact on CO2 levels with a group of four people in a confined space. The engine was switched off and the windows kept closed to avoid any flow of fresh air inside the vehicle. The datalogger showed that when the passengers got inside the car, the CO2 level was 1,000ppm. It then rocketed to almost 4,000ppm in just 15 minutes. At that stage, the atmosphere inside the cabin had become extremely stuffy and unpleasant. Next came the road trip. The first car journey involved two people travelling to the supermarket. The CO2 from their exhaled breath increased the concentration of CO2 in the car cabin to around 1,400ppm. Surprisingly, it only took about forty five minutes to reach this level, which shows how quickly CO2 levels can rise. The datalogger was then left in the car overnight with the windows closed. 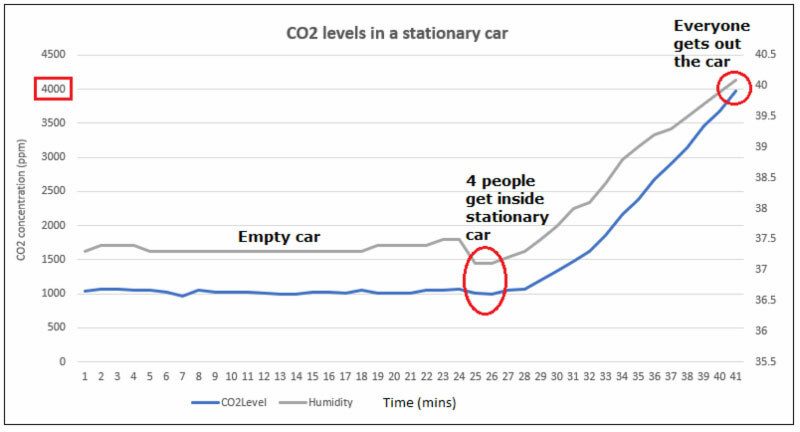 The graph shows just how long it takes for the CO2 to disperse from a closed car, taking until around 9am the next day to drop down to nearer ambient levels of CO2. The second car journey recorded four people travelling non-stop from Wales to Scotland. With four people, the level of CO2 shot up even faster, reaching 2,000ppm in about twenty minutes. This is the level where CO2 symptoms can start to cause loss of concentration, headaches and sleepiness for example. Fortunately, they opened the windows to bring in fresh air from outside, which reduced the CO2 to more acceptable, ambient levels within an hour. Dr David Moodie, added: "Our real world datalogger measurements show how CO2 levels can rapidly build up in an enclosed space with several occupants - and in a relatively short space of time too. The results on both journeys exceeded The World Health Organisation guideline that CO2 levels should be below 1,000ppm." The datalogger used in the experiment measures CO2 concentration, air pressure and temperature, along with relative humidity every few minutes. This unit was designed and built by GSS and it uses one of its low power, ambient air, CozIR-A sensors. GSS's unique LED technology at the heart of its sensors means that it has a very low power consumption, unlike many other CO2 sensors that need mains power. This enables battery-powered CO2 monitoring products to be created, such as this datalogger, that is able to record over a two week period without needing a change of battery. Dr David Moodie, concluded: "This ability to be battery powered for long periods has opened up a whole new range of design possibilities for CO2 monitors. Now it's possible to have handheld breath monitors with high speed sensing for people with respiratory conditions, portable leak detection instruments, handheld MAP analysers, and wireless air quality monitors for IoT applications. These are just a few examples of what is achievable, the possibilities really are endless." According to a 2005 poll by the American National Sleep Foundation, 60% of adult US drivers - about 168 million people - said that they have driven a vehicle while feeling drowsy in the past year. More than one-third, (37% or 103 million people), have actually fallen asleep at the wheel. Of those who have nodded off, 13% say they have done so at least once a month. According to data from Australia, England, Finland, and other European nations, drowsy driving represents 10-30% of all crashes.